I don’t remember the first time I found out about the Iron Giant. I know it wasn’t in theaters, I wasn’t one of those lucky few that caught it during its brief and relatively unsuccessful theatrical run. I don’t remember if I went back to it after watching Brad Bird’s later feature the Incredibles or if I just happened across it on TV or a random video rental trip. I always thought it was an interesting look that called up the retro 50’s style and the film itself is actually set during that time as well. It was also a movie that I didn’t initially consider as a superhero movie, but when I did my final poll for the 100 Essential Superhero Movies I included it and it nabbed the second spot, which is likely more a testament to the quality of the movie than to its place as a superhero movie. There are definitely superhero elements; this is an origin story of sorts, the Iron Giant himself has more than enough super powers, and at the end of the day he uses Superman himself as inspiration to save an entire town. I will do my best for this to not just be a gush fest, but it will be tough as this is one of my favorite movies and it’s a shame that it has taken me this long to get around to reviewing it here. The movie essentially follows the precocious Dennis the Menace type of kid named Hogarth Hughes. He’s got the requisite high pitched voice with a hint of a squeak to it, and he inadvertently causes trouble no matter how good his intentions are. This is obvious with the first introduction where he is trying to convince his single mother to let him keep what is obviously the latest in a long line of inappropriate “pets”. In this case, it’s a squirrel which turns into a moment of slapstick to also introduce Dean, voiced by Harry Connick Jr. Once Hogarth eventually finds and befriends the Iron Giant, he quite predictably starts to treat the giant like yet another one of his “pets”, including a great moment where he tries to convince the giant to stay while Hogarth goes home. Invariably, the giant either can’t understand or doesn’t wish to comply and instead continues to follow Hogarth home. There are several of these motifs that are foreshadowed early on in the movie only to pay off in the third act. I quite enjoyed the comic books early on, especially since this is Warner Bros who own the rights to DC comics and so were able to actually show an Action Comics with Superman on the cover instead of some generic superhero. I don’t think the emotional impact at the end of the movie when the Iron Giant finally declares himself to be a hero would have been as great if he had called himself “Hero Guy” or something similar. It carries that weight and the emotional resonance because the viewer brings all that knowledge of Superman and what he represents, and when the Giant finally declares himself to be “Superman” as he goes on to sacrifice himself for the good of the town and especially Hogarth, it hits home hard. There’s also the great thread about how he was quite possibly intended as a weapon, but when he sees what guns do to living things through a scene involving a deer and a pair of hunters he learns that guns are bad. This comes up later as he is protecting Hogarth from the army that is attacking him, but he insists that he is “not a gun”. 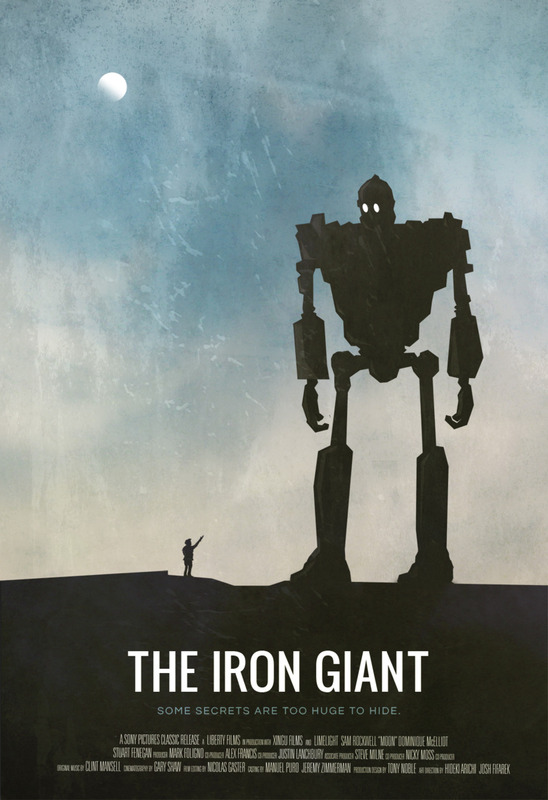 It’s unclear what the Iron Giant’s origins are, or his motivations, his intentions, or anything for that matter. He is this unexplained entity from another planet and the only thing known about him is eventually that he can be used as a powerful weapon. Instead, when he is first exploring his surroundings, he gets tangled in some power lines which somehow cause a glitch in his programming to where he essentially loses any memory of his mission. But he is still able to learn and so he becomes this alien blank slate that learns from the innocent Hogarth as well as the free spirited Dean to a lesser extent. And while both of those character do use the giant for their own ends, they also think of him as an independent soul, bringing home one of the other great lines of the movie, which has also been used in many other places to great effect “You are who you choose to be”. Even though the giant may have been programmed to be this extraterrestrial weapon of mass destruction, circumstances have given him the ability of free will. This allows him the opportunity to go against what he was designed to do and become his own entity. Of course, this wouldn’t be considered a superhero movie if there wasn’t a villain. And this movie has one of the more interesting villains out there. Agent Mansley feels like some type of mix between Agents Mulder and Scully. He’s a member of the paranormal research division of the government, but he doesn’t really take his job seriously and is ready to move onto the next job. But when he realizes that there really is something to be discovered on this job, he desperately wants to use it to further his own career. Not only that, but there’s also a heavy threat of the Red Scare which makes sense as this is set in the aftermath of World War II. While he thinks that he’s doing the right thing, he is doing it for extremely selfish reasons. At first, he feels like a very impotent villain that’s much more a source of comic relief rather than being a serious threat. That all changes as the movie leads up to the third act as Mansley finally gets proof in the form of a photograph of the giant taken unintentionally by Hogarth from the beginning of the movie. It is an excellent moment of Chekov’s gun which is used quite often and quite cleverly throughout the movie. Mansley interrogates Hogarth and gets the information out of him after using the threat of being taken away from his mother. He then proceeds to drug Hogarth and place him back in his bed to try and convince him that it was all a dream and never actually happened. His villainy continues to grow as he is initially thwarted when Dean and Hogarth make the giant look like one of Dean’s scrap art projects. In return, Mansley ignores the fact that the giant is protecting Hogarth and insists that the army destroy it by any means possible, culminating in him giving the final order to fire the nuclear strike on the giant as it remains in the center of town. There is so much to enjoy about this movie I could go on for pages about this movie. While there are many serious and intelligent concepts presented throughout the movie, it is still a children’s movie at heart. From beginning to end there are many moments of great humor that the entire family can enjoy. The squirrel scene from the beginning gives the movie a great start, and it continues with the hilarious moments when the giant’s hand is exploring Hogarth’s house like one of his escaped pets. Dean’s reaction to the giant is also very funny, especially the moment when he goes back into his house followed by the title card “37 minutes later”. Even the one moment of bathroom humor is used to good effect, reminding viewers that Hogarth is still a child and is prone to do childish things like slipping Mansley some laxative chocolate. I love this movie, Jena loved this movie, my wife loved the movie. If you haven’t seen it, do yourself a favor and check it out regardless of your age. Until next time, this has been Bubbawheat for Flights, Tights, and Movie Nights. Posted on September 10, 2014, in 90's movies and tagged animation, film, movies, review. Bookmark the permalink. 8 Comments. It’s hard not to. It’s such a well crafted scene. Thanks, it’s one of my favorites and I did my best to do it justice. Aye, you did. I wrote about it and another I love equally in comparison piece a few years back. Wonderful film that gets me every time I watch it. Hope WB will finally release it to Blu-ray sometime soon. How dare you forget about the Iron Giant! Haha, I think it has grown in popularity over the years, but it had a long way to go.